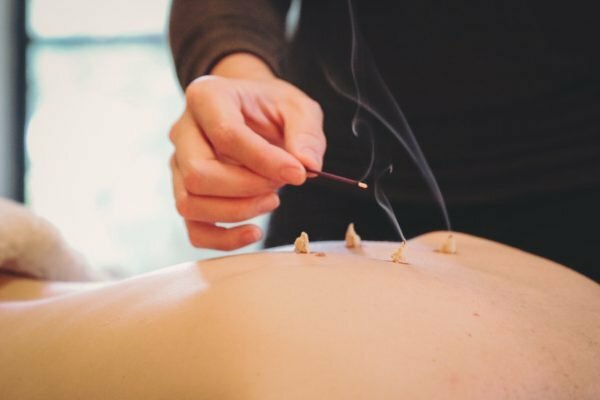 In Chinese medicine moxabustion and acupuncture are often considered two parts of the same treatment. Moxabustion can also be done as a stand alone treatment, and is a good option for needle sensitive, or needle averse patients. It involves applying a layer of protective salve on specific acupuncture points on the body, and then placing a small amount of the herb artemisia argyi, on the point. Lit with a burning incense stick, artemisia argyi burns down until you feel a gentle warmth.The herb is then removed before the hot part touches the skin, resulting in only a soothing, warming sensation for the patient. Scientifically shown to release 43 volts of energy while burning, this herb is like no other herb! The warmth it emits can penetrate deeply into the body in a comfortable and relaxing way.